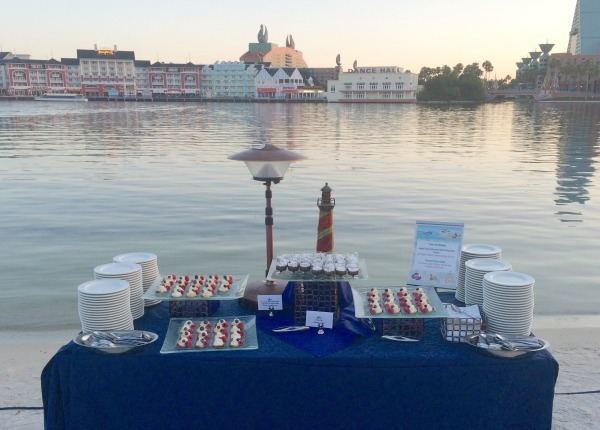 As if staying at Disney’s Yacht Club Resort during the Disney Social Media Moms Celebration wasn’t amazing enough, we were invited to attend a private family party on the shore of the Beach & Yacht Clubs on one of the nights. As our family walked together towards the beach, we could hear relaxing steel drum music playing in the distance. The beautiful sunset that evening reflected off Disney’s Boardwalk and the lake in the background. I loved the casual vibe in the air and how relaxed everyone was. 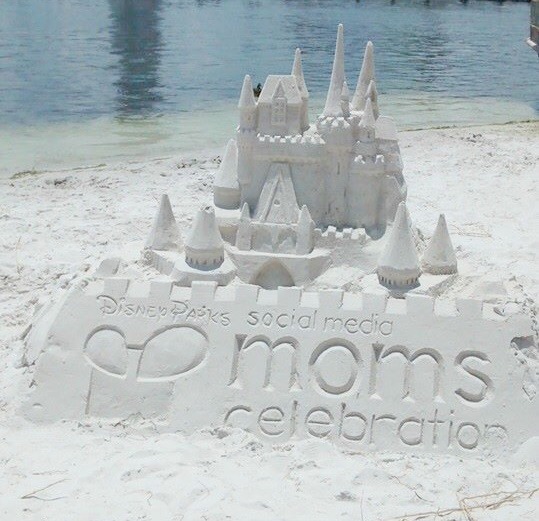 It was so fun to see Mickey & his friends dressed in “beachy” attire for the occasion, I was also in awe of the Disney Social Media Moms Celebration sand sculpture that must have taken quite some time to carefully construct. 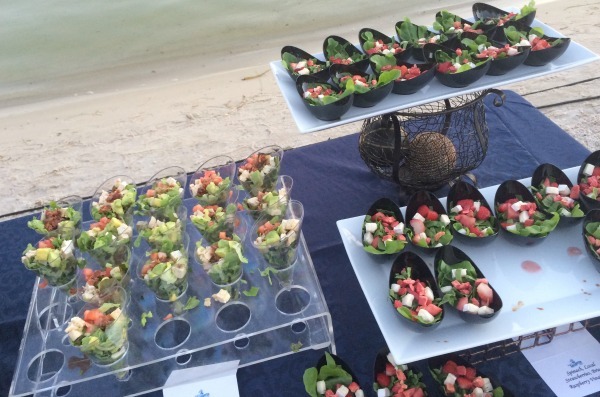 Everywhere we turned, there were mini buffets set up for guests to enjoy delicious salads, gourmet main dishes and delectable desserts. The chefs at Disney really took the time to put together a menu that offered something for everyone in a family, even including adults and children with dietary restrictions and food allergies. There was also an bar set up along the beach, serving all kinds of drinks, including some refreshing tropical libations for the adults. 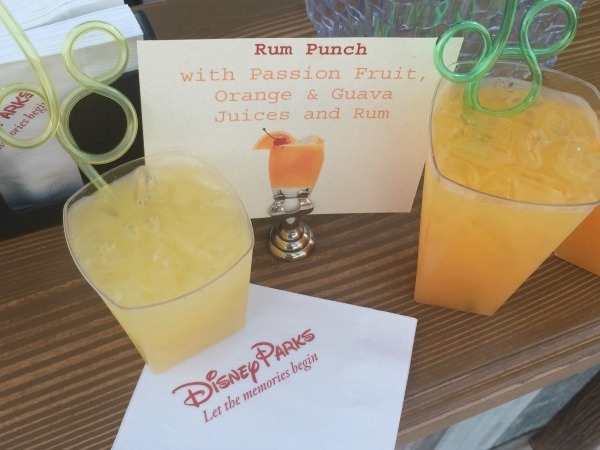 It’s much more fun to drink Rum Punch through a Mickey straw, don’t you agree? The kids had a blast playing on the sand and dancing with the Mickey and his frends, as well as some of the young, energetic Disney dancers. My daughter adores Teen Beach Movie, so this kind of dancing and entertainment was right up her alley! I enjoyed myself immensely and took advantage of the time to connect with other social media Disney friends like Flowers Croon and her daughter. 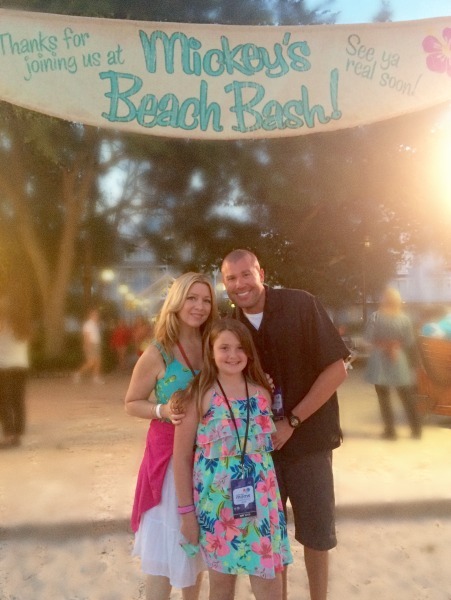 Mickey’s Beach Bash was a blast and definitely a night our family will always remember! 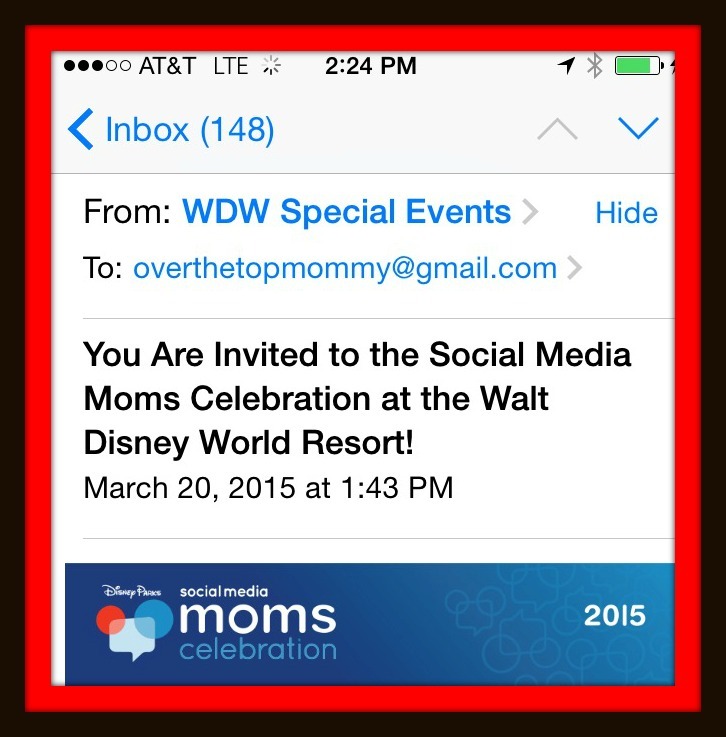 I was invited to The Disney Social Media Moms Celebration as media and received a media rate for our accommodations. All opinions are 100% my own. In the two years I’ve been blogging, I’ve been fortunate enough to attend a few different conferences. I love going to conferences! The more I attend, the more I want to seek out to attend! I take away something new and valuable from each conference and always leave feeling recharged and newly inspired. I’ve also experienced what I like to call “conference regrets“. If you’re not sure what those are, they are the things you wish you’d done at a conference, but either forgot or were too intimidated to do, for whatever reason. I feel like I get brave after the conference is over, except then it’s too late to go back. I’m almost sure that every blogger has experienced “conference regrets” at least once in their career. What I’ve found to be most effective for tackling this problem is to take some time, prior to attending a conference, to set some small personal conference goals for myself. 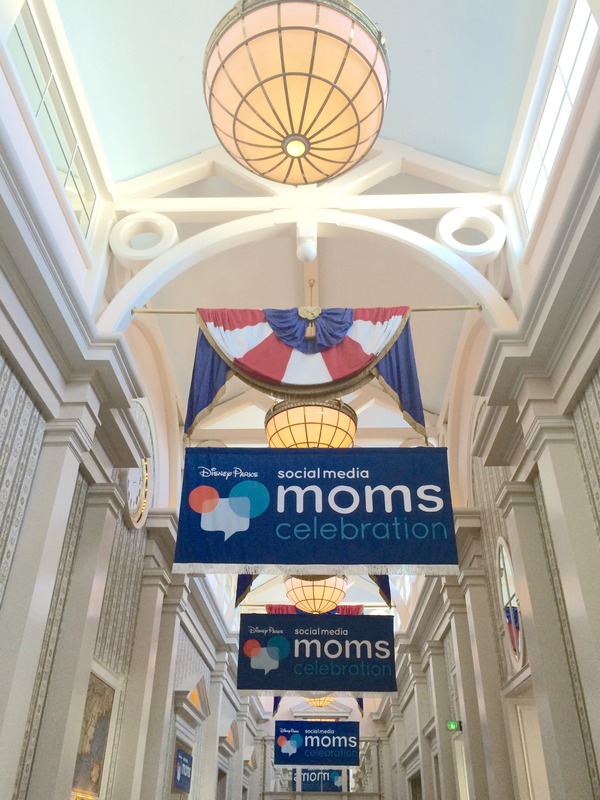 I was recently invited to attend The 2015 Disney Social Media Moms Celebration at Walt Disney World Resort. I can still remember how magical it was when I opened that email containing such a special invitation! I think I let out a squeal that was probably heard around the world! It was such an honor to be invited and I really couldn’t believe it had happened for me. I KNEW I had to make every moment of what would be a “once-in-a-lifetime experience” count! So, in the weeks leading up to the conference, I proceeded to jot down notes on post-its until I’d put together a list of my personal goals for this conference. At first I felt a bit overwhelmed by this goal-setting because I didn’t know what to expect from the conference itself. I’d heard so many stories and read several posts from others who had attended in the past, but I really wanted to focus on what was most important for me to take away from the experience. 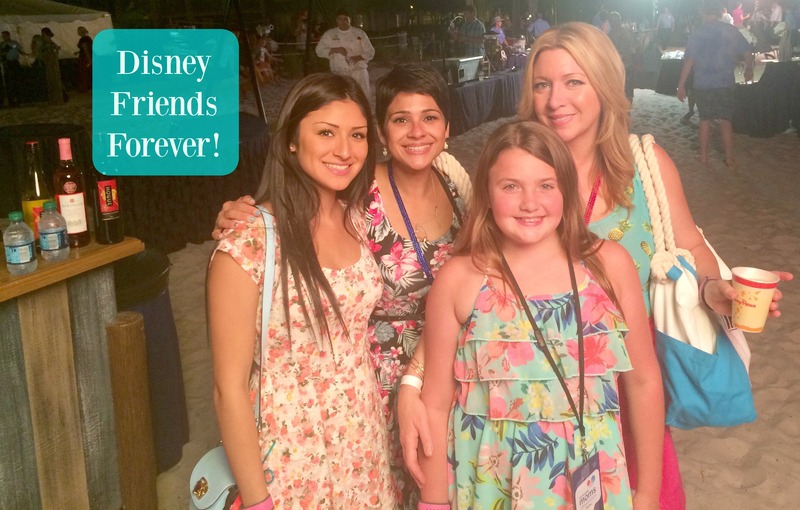 Finally, I compiled a list of 4 intangible things I’d be bringing with me to The 2015 Disney Social Media Moms Celebration, so let me share these things with you! The first thing I brought to the conference was my love for Disney. I believe each and every one of the invited attendees has a love for Disney that’s unique and special. My own love for Disney stems from my childhood. I grew up in Southern California and our family was fortunate enough to live very close to Disneyland. (It was just Disneyland back then, not Disneyland Resort) As a child, I got to visit the park about once a year, usually during summertime. 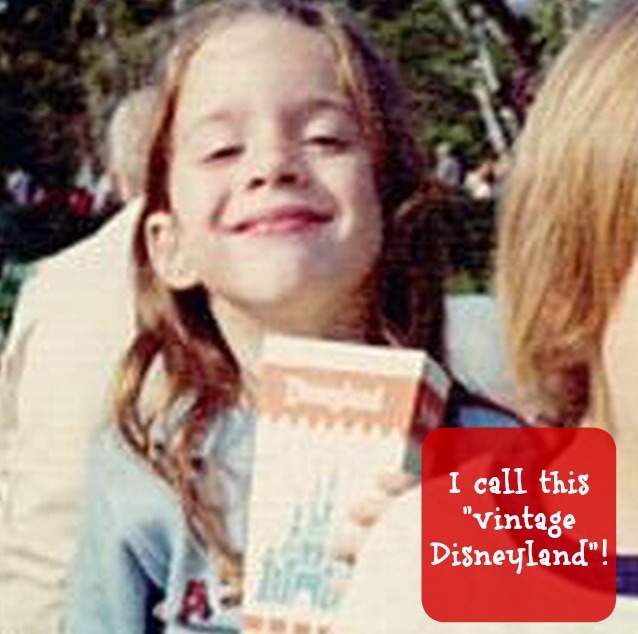 Visiting Disneyland with my family, as a little girl, is one of those childhood memories I can still actually recall vividly. 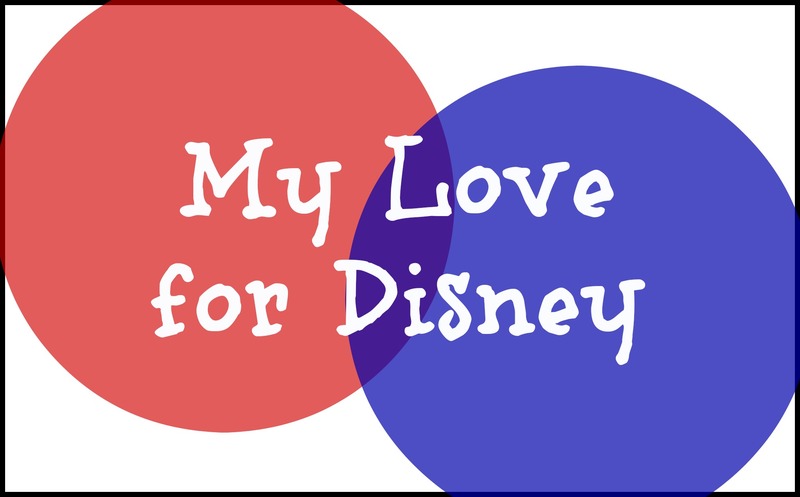 My love for Disney has grown by leaps and bounds as I’ve grown up. (Confession: I’ve actually never grown up though) I’m a proud Disneyland Resort Annual Passholder and visit the parks as frequently as I can. 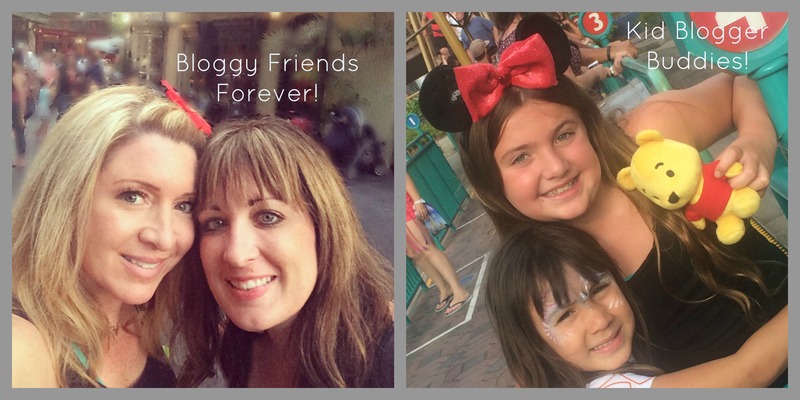 As a mom, I’ve had the opportunity to create special Disney memories with my own daughter. My love for Disney also carries over into many other aspects of my life too. I try to live life in “a Disney way”, which is something other lovers of Disney can fully understand. 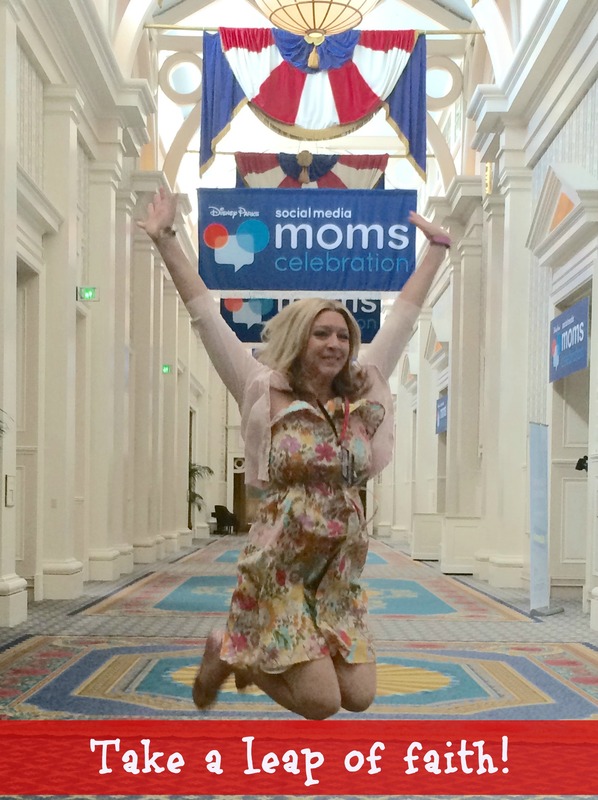 To be in an entire ballroom filled with other Disney-loving moms (and a dad) was an amazing experience. 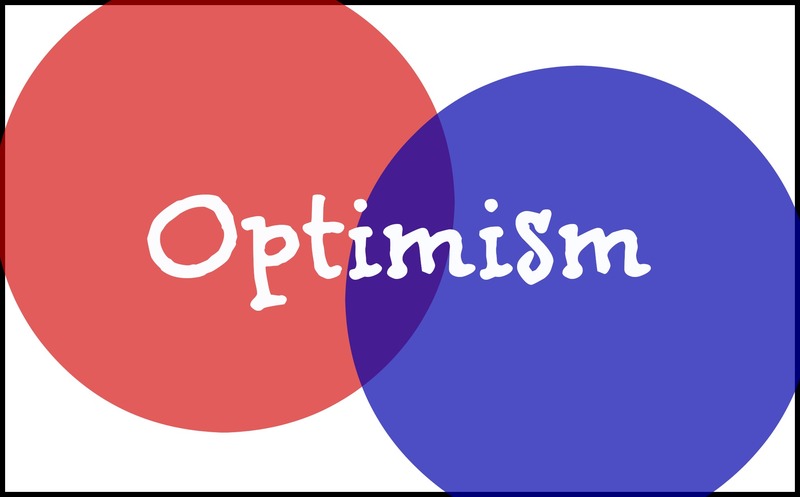 Optimism was a very important thing to bring with me as well! It’s beyond important to come to a conference with an optimistic attitude. I consider myself a “Glass Half-Full Kind of Girl” and always try my best to see a positive side in every situation. Each conference is an new opportunity to connect with other influencers and often times, brands. If you walk in with a positive attitude and are full of optimism, it’ll draw people towards you and they’ll to want to get to know you. It’s also something that will make brands want to work with you. I’m always optimistic that something good is going to happen. Remember, “If you can dream it, you can do it!” Stay optimistic! I’ve saved the best for last. 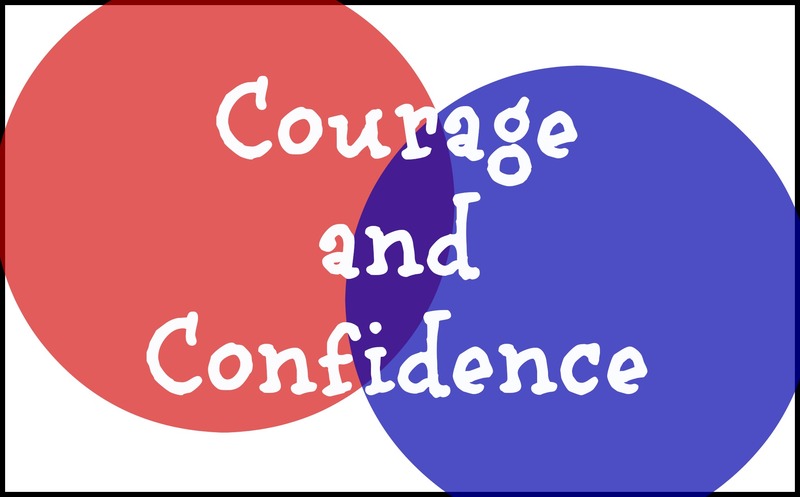 I think courage and confidence are the most vital things you can bring to a conference! I am speaking from experience and as someone who has had “conference regrets” in the past for not bringing these with me! As I entered the convention center at Disney’s Yacht Club Resort and started to walk down the long hallway, it felt as if my breath had literally been stolen away. (in a good way) Hanging from the boughs were these amazing and enormous banners! It was surreal. I had mixed emotions at the moment before I entered the room for registration. On one hand I felt like royalty, on the other hand, doubt started to set in and I began to second guess myself. You can’t do that! You CAN’T doubt yourself! This is where courage comes into play! If this starts to happen to you, just do what I did….I gave myself a pep talk (inside of my head of course). I told myself that I needed to remember my courage! I needed to have courage and confidence because I was there for a reason! I needed to have courage to approach people and make those connections that I’d come all this way to make. I needed to have courage and confidence in myself when others would ask me about what it is that drives the passion behind my own blogging. It’s important to remember that you are worth something! You are just as good as anyone else at the conference! If you think for one moment that you aren’t as good as some of the “bigger bloggers” who may also be at the same conference as you, just remember, they were once just like you! Honestly, if you approach most of those women, you’ll find that they aren’t as intimidating as you envision. I’ve become friends with many of the “bigger bloggers” and I can say they are some of the kindest, most uplifiting women in social media and, often times, will even help you out. I packed all 4 of these intangible things into my suitcase and took them with me to The 2015 Disney Social Media Moms Celebration. I walked into that conference with all that I needed and I did my best! What’s most important to remember is why you came and what you hope to achieve. As you can see, I took a leap of faith (or should I say a jump of faith). Believe in yourself and don’t ever lose your courage or confidence! Blended Conference is Near and Dear to My Heart! Here’s Why I Think YOU Should Attend! I will totally admit that I’ve been excited about attending Blended Conference since the 2015 date was announced! Actually I may have been excited about it for even longer than that! I truly can’t wait for September 18! I love conferences, I love road trips, and I LOVE Blended! Blended is a blogging conference in Arizona, started by Wendy from Around My Family Table. In its first year, it began as much smaller event, with just a small circle of Arizona food bloggers and food enthusiasts in attendance. That first event was so successful that it transformed it into a larger conference the following year, to include bloggers of every niche. It has become Arizona’s premiere blogging conference! 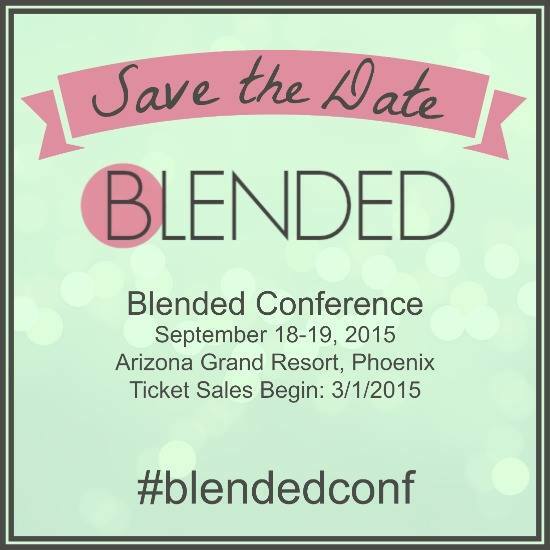 This year, Blended will be held September 18 & 19 at Arizona Grand Resort in Phoenix, Arizona. You should save that date on your calendar and grab a ticket for Blended here. Did I already mention how excited I am to attend? I’m so honored to be a Blended ambassador this year. It was the first blogging conference I attended when I was a brand-new blogger. I’ll never forget how much I took away from that amazing weekend, back in 2013. 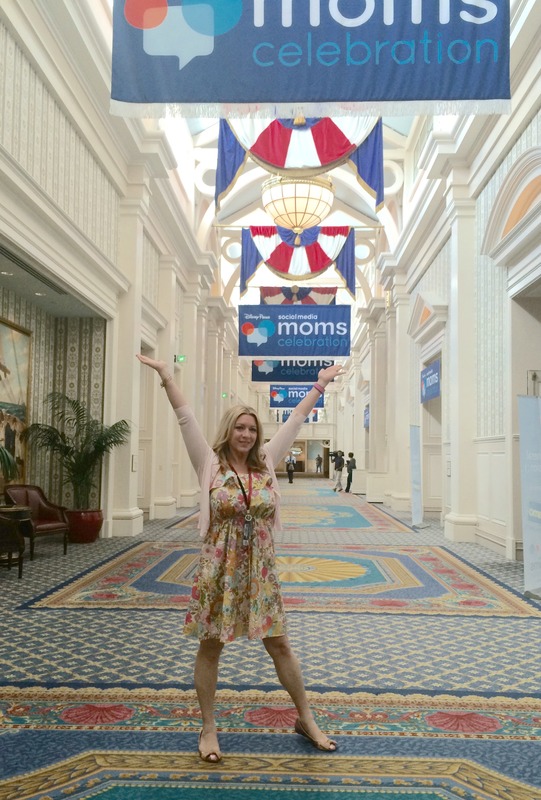 They say “you’ll never forget your first blogging conference” and I think it’s actually very true! So, let’s talk about some of the things that are bound to happen if you attend Blended Conference this year…. You’ll learn something new: Whether you blog for fun or are trying to build your own unique brand, you’ll definitely learn something new at Blended. Actually, I think you’ll learn many new things. I know I learned a ton at Blended last time. There is an amazing lineup of speakers scheduled already. Have you seen yet? You’ll have so many opportunities to ask questions about things you’re dying to know about, relating to the world of blogging and social media. You’ll also find that you pick up a lot of tips from other bloggers you end up networking with. You won’t go hungry: For me, this is an important one. (Can you tell I’m a foodie?) I can guarantee that you will not go hungry at this conference! Between the meals and the snacks, you don’t have to worry! Also, there’s usually an “unofficial” Blended dinner after Saturday’s conference, that all are invited to join, so the eating continues! You’ll leave with some fun swag and might even win a prize: Not only did I go home from Blended last time with two bags of really fun swag, but I also got lucky and won one of the prizes in a drawing. I know there’ll be plenty of those this time around too. Everyone loves swag! You’ll get to meet a bunch of the Arizona Bloggers and maybe even gain a “Bloggy BFF”! : The circle of Arizona Bloggers is pretty big and they’re all pretty awesome! Being able to add them to your social media network is a definite plus. The Arizona bloggers were some of the first social media superstars I got to know in person and since attending that year, some of them have become some of my good blogger friends. It’s wonderful to know such incredibly positive, helpful, and supportive women. These are the kinds of qualities you can appreciate when you’re building your “tribe”. I actually met one of my “Bloggy BFFs” at Blended. She was someone I’d looked up to online and when I met her I think I was “fangirling“! (Do you know Heather from Brie Brie Blooms? Well it’s her!) After eating lunch at the same table that day, we realized how much we had in common and we have become great friends. What’s even more fun about it is that our daughters are friends too. They both claim to be kid bloggers too, so they’ve also got that in common. Bloggy friends are the best! You’ll most likely develop “Conference-itis”… If you’re not sure what that is yet, it’s when you get the itch to attend another conference right after you’ve just attended one. Maybe we should call it getting “Conference Fever“? I can’t get enough conferences under my belt. It’s one of my favorite things to do! You’ll get to meet me! 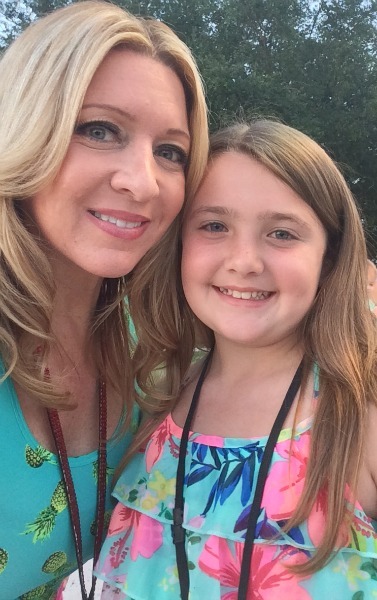 : I’ve saved the best part about attending Blended for last…you’ll get to meet me! I’m not trying to toot my own horn here, but I’m really fun to hang out with AND I’m a great friend to have! If you haven’t had a chance to browse the Blended Conference schedule yet, click here. Tickets are already on sale and you can still grab one at the early bird price until May 1, by clicking here. Arizona Grand Resort is offering unbeatable rates for Blended attendees. You need to take a peek here. I hope you’ll be joining us at Blended Conference! Leave a comment below if you’re attending so we can connect more beforehand too! Connect with Blended Conference on Facebook, Twitter, and Instagram! I was provided with a discounted ticket to Blended Conference as part of the Blended Ambassador Program. All opinions are 100% my own. Blended Conference 2014: Why YOU Should Attend! Last Fall, I had the opportunity to attend Blended: A Conference in the Desert. It was the first blogger conference I ever attended. I was what you’d call a “newbie blogger”. (I actually still am) Although I was excited to attend, I was also very nervous about it. (I now know there was nothing to be nervous about) Although I’m not a shy person, blogging, and all that it entails, was an area new to me, so I really wasn’t very sure of myself or even HOW I’d come across to others. At that point, I was even still trying to figure out my blogging niche, as well as the tech side of blogging. I cannot even begin to describe how invaluable that experience of attending Blended last year was to me! It was a 1 day conference last year. This year, it’s an entire weekend and after I saw the location and the agenda for the weekend, I got even more excited! I’m going to give you 5 great reasons why YOU should attended Blended this year! You should attend because I will be there! Yep, I wouldn’t miss Blended Conference 2014 for the world! I am so excited for the little road trip back to Arizona, from California, to see all of the friends I made at the conference last year, as well as to meet a whole bunch of new ones! (including you!) I’m not saying that I am like a headliner for the conference or anything, because I’m not, but I would consider myself a pretty fun bloggy friend to have. Oh, and I LOVE taking selfies with friends! Please attend so I can meet you! You should attend because the ladies who are responsible for running the conference are are not only amazing, but are also both named “Wendy”, which happens to be my name, so seriously, how can that NOT be a good enough reason on its own? I first met Wendy O’Neal from Around My Family Table and Wendy Wright from Choosing Love and Arizona Moms Network online. Before getting to actually meet these 2 in person, I was worried I’d be intimidated when I met them, but once we were all together at a dinner the night before the conference last year, I immediately felt comfortable talking to them and several other people I’d refer to as super bloggers, who I’d also only met online. I will admit that I sat there #fangirling Wendy and Wendy at the conference, but that’s a good thing. They definitely land in my book as “superwomen” and I’m proud to be a part their #TeamWendy. Obviously if your name is also Wendy, you REALLY need to make sure to get to this conference! You should attend because you’ll have so many opportunities to network with other bloggers, the speakers and with some brands. This is a very important reason, especially if you are a new(er) blogger! Networking, meeting other bloggers, including the conference speakers, and actually starting relationships and friendships with them, is probably one of the most useful things you can take away from a conference. There is a big difference between meeting someone online, like on Facebook or Twitter, and actually meeting them in person, allowing them to get to know you, and you being able to get to know them. You never know who the person sitting next to you or across the table from you, really is, or what connections they may have. They also may see something in you that they like and throw some great opportunities your way! You just never know! You also have the opportunity to network with brands, because there are brands represented at Blended conference and at certain times during the conference days, you have time to actually introduce yourself and meet some of the brands’ PR people. PR people are really just regular people, so although it may be intimidating to approach them, you should just do it. Approach them with your business card, introduce yourself and just chat with them briefly. You honestly never know who is going to make a positive connection with you or when it will happen, but it will! I speak from experience and like I said before, I’m still a newbie. You should attend because, once again, there is a going to be a fabulous agenda with fabulous speakers (and fabulous food) at Blended this year! If you take a peek over the agenda, what you’ll find is a ton of fun and knowledge coming your way! *Scheduled Head Shots with Kate Eschbach on Friday afternoon! *Maureen Fitzgerald, also known as Wisconsin Mommy, will be talking about Creating a Media Kit. *Christine Pittman from Cook the Story, will have a Food Styling…Live session. *Dan Morris of Letters from Dan and Blogging Concentrated, will be presenting SEO Simplified. You should attend because Blogging Concentrated for advanced bloggers is going to have its own day during Blended this year! This is an incredible offering that you just shouldn’t pass up and very unique to this conference to have a component piggy backing like this! I had the pleasure of meeting Dan Morris recently at another conference and not only is he going to present a wealth of information, he is also a really fun guy to hang out with! I could probably give so many more reasons why YOU should attend Blended Conference this fall! Maybe I’ll write a 2nd post with Reasons #6-10….maybe! To get more information about Blended and register for it, click here.